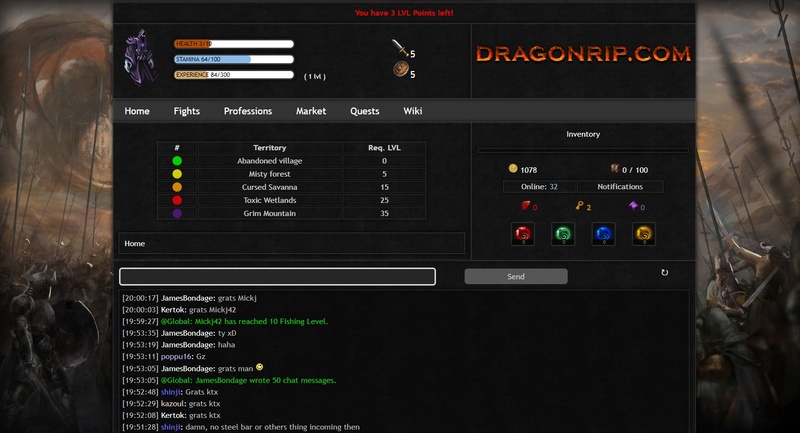 DragonRip game is fantasy fighting browser game with multi-device support. Train yourself to become stronger, hunt monsters, do quests and learn new skills. Various fighting fields, auto-attack feature. Gather equipment, gold, experience and gems (can be used for upgrades). You can fight bosses to obtain rare equipment. Train a profession you see fits you the best. Lots of frequent updates. Community is big part of the game. This game is really awesome and you should take a look at it. I think this game is great it makes it so you have to grind but it’s a fun grind not some boring watching just words you actually get to see what you’re enemies look like. Nice game all arround! I was seeking a game to both invest my time to process without the daily limits/caps and also for few minute breaks to give long term commands. Dragonrip hit the mark, I am glad to be part of this fast growing game. When you join, join the light! Smite down the darkness with us! Fun text game with a good balance of an “energy system” while not hindering you from doing things when you run out, and providing plenty of ways to get energy back without spending money on in-game purchases. A fun game that’s strangely addictive! Felt like a slow start, but with quests to guide it’s quick to guide you through the basics until you’re suddenly hours in. Dragonrip has elements of idle game and is perfect to keep open on a second monitor while getting work done. This game has enough depth for less casual players to sink their teeth into, and is easy enough for casual people to grasp quickly. The dev seems to be around a lot which is good because absent devs can be the death of games such as this. Give it a try if you like the genre. Kind of what I’d expect if RuneScape was an idle game. Has tons of professions which support combat in different ways, and many server-wide events. Consistant 6-second action time/auto-combat, and 120-minute captchas (with rewards!) makes it easy to schedule interactions with the game so you can always make progress. Been playing over a year now, a lot of time invested to be the #1 fighter, highest level, most kills, highest slayer level currently in game. I recommend it if you like a good semi idle game that has a lot of features and continuous updates. DragonRip is a fresh game(less than a year old) with constant updates, active owner, active community(although sometimes the chat is death). In the beginning the low amount of stamina and the inventory limit is kind of frustrating, but after few weeks of playing the real fun begins. Buen juego, un clasico de los antiguos. I play a few time and I like a lot. If you like scroller mmo, then you’re in for a threat! Great game , been playing it for over 8 months. It has progressed a lot in that time frame. I would recommend it to anyone. This is a good game to run in the background to make your work day go by faster. Awesome game that can potentially be your new favourite one. Tons of things to do, good community that always help newcomers, the developer is always updating the game with new stuff and you dont need to be advanced in the game to enjoy all of the features such as events, professions or fighting, there is always something to do and something for everyone. Great game overall, good ratio of idle/semi-idle to keep you hooked playing all day. Gets updates often and the community is always helping newcomers. It is a good game. Played over a Year now. well thought out classic MUD style game. The admin here codes very fast and has a great understanding of players needs. Great, well developed game, with rich content . This lowspec text MMORPG is definitely what I’d expect from one in 2018. It has, essentially, utilized all the key points from the past and honed it into an efficient little machine. The difficulty curve is steep and it’s great if you’re in it for the long game, but you can get a lot of achievements from the jump. Give it a shot gentlemen. It’s still fresh and is updated frequently by a very wise coder. Great game very addictive always improving and friendly players. I like this game ! It’s well done and always improving ! Very fun game. Reminds me of old school fantasy mmo’s. I played this game over 3 months and like it.